I am riding the Pan Mass Challenge in support of those unnamed friends who over the past years have been diagnosed with cancer. Since I started riding five years ago I am amazed by the number of folks who have been affected by this terible disease. Their courage and optimism inspires me and their and worry and fear push me to train a little harder and ride a little longer. I am riding for those family and friends of my suporters whose names will be on my jersey. I am riding because I am tired of riding. 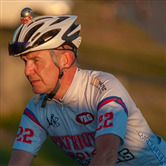 I am riding the 2019 Pan Mass Challenge in memory of Bob Lindsay. Bob was the partner and husband of Martha for 31 years and the father of Sarah and Rachel. An avid sports fan he mentored and coached Rachel in basketball, was her ardent cheerleader, and biggest supporter. He never missed a game, musical performance, or parent/teacher conference. He and Martha loved to travel, and family and friends were frequent guests at their many impromptu barbecues. Bob loved to volunteer his time, particularly for his girls’ sports teams. If he wasn’t coaching, he was behind a camera, creating a game tape, driving the team to a game, manning a bake sale table, or planning an after season party. I am riding the Pan Mass Challenge to support the work of Ken Anderson at Dana Farber. Dr. Anderson’s research focuses on Multiple Myeloma. Ken was Bob’s doctor and, when Bob was initially diagnosed, Ken told Bob and Martha not to be alarmed by the statistics, because so many promising treatments were on the horizon. Ken was right, as Bob lived with Multiple Myeloma for eight years, five more years with Sarah, Rachel and Martha than the 36-month average life expectancy. Ken’s dedication to Bob and to his other patients and family members is legendary. I am riding the Pan Mass Challenge for Bob, Martha, Sarah, Rachel, Ken, and all of the unnamed who have been stricken with cancer. I am riding for the loved ones of my many suporters. I am riding because I still can.